A real saviour for winter dry skin. The prize – 30 ml for 50 dollars. This oil is my number one indulgence during the winter. After asking for numerous samples I finally made the purchase at the taxfree at Nice airport (where it was cheaper, probably because it‘s French duh). I use this oil when my skin is giving up during the winter months and I need not only pampering but something that smells calming and exotic – which this oil does to me (patchuli, rosewood and hazelwood is a good combo for me). It‘s sinks in easily and I apply my day cream and make-up on top of the oil pretty much straight away without making a big mess. The down-side of this oil is its glass bottle (made for disaster for clumsy people like me) and its heavy price. It dries in very fast and is very hydrating. The bottle can easily be used up in 3-4 months. I have a bit of an obsession with Swedish L:A Bruket, because I am attracted to the idea of a brand founded by the sea, incorporating natural products into stylish bottles of “things that actually work”. Having an obsession with oils I am trying to replace every product on my beauty shelf with an oil. This time my serum had to go to make space for this precious bottle. This oil dries in fast and is very hydrating. It smells of bergamot and you can see carrots have been used in its bright orange color. Using this oil only is not enough since it in itself is not hydrating enough by a boost of a day/night cream is needed. I like that the bottle comes with a pippette which makes it easy to directly drop the oil on my skin. Takes away make-up very well and can be used as a “semi-oil”. You get a lot of oil per pump. 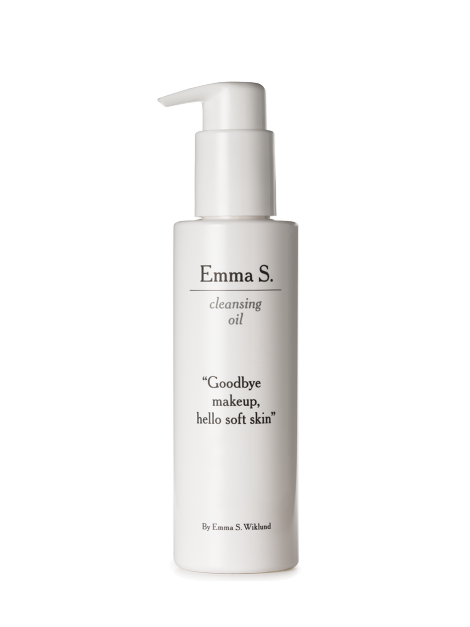 This is my first cleansing oil (this blog contains many firsts and I am very happy to have you with me on this adventure of beauty dear readers). First and foremost I really love the smell of this oil, the smell reminds me of my grandmothers creams and sun oils, and therefore lazy summer days spent on the country side. Secondly it works great on my skin. Normally my skin likes to break out when I use oils, but I have not noticed anything like that, using this cleansing oil. Sometimes when I feel like I need a break from my evening routine I just use this cleanser, and no tonic afterwards and skip the creams, and the result is my skin still feels hydrated. It removes make-up very well (even when you accidentally smudge mascara on your forehead). The only minus is the price and that you get much more then needed per pump. I do not feel a great difference, which I expect for this price. My hair loves oil, and likes to eat at least a spoon every second day. It is an expensive habit, but I do believe that beautiful hair can help all your other body parts. Going to the next level with your hair might drag the rest of you with it, forcing you to upgrade your beauty regime once your hair reaches Loreal commercial perfection levels… Despite having found my perfect match I still like to see what is out there, a few months ago I started a love affair with the Bamboo line and since their dry oil mist was bananas, I wanted to try the concentrated oil, the real deal so to speak. The oil comes with a dropper, making it easy to dosage it. It smells the same as the rest of the Kendi products, which is synthetic but nice, and has a slightly runny texture. It makes my crazy big hair softer, without making it greasy. It also makes my hair shiny and yes I see a difference. The problem is just, that the difference is not big enough. 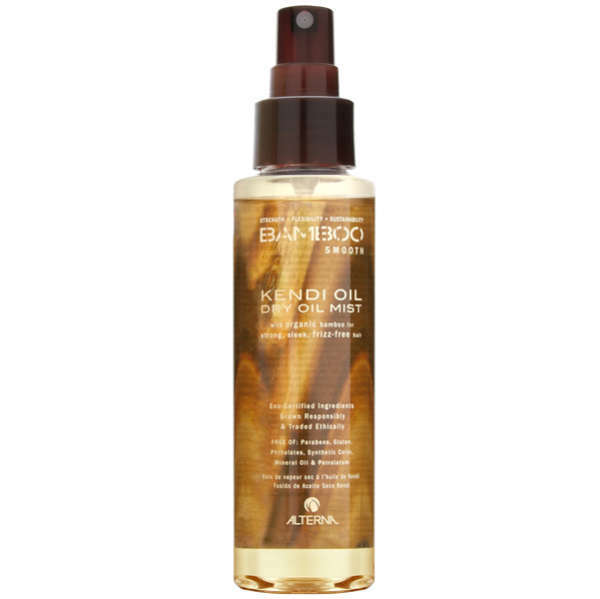 Though this oil works, the bottle is tiny so if you have big hair you will use it up quick, and it only helped when my hair was “medium” dry, thus applying it after a rough week on the beach will hardly make a difference, and unfortunately my hair is very confused and constantly thinks it is on the beach..I will review more products from the Bamboo line, so stay tuned. Gives your hair that nice hair commercial look we are all striving for: hair stays in place and gets a nice shine. And it is free of parabens. The price and that you have to use it daily (a spritz will not last until the next day). Amal Alamuddin is my new hair hero. unfortunately we have different hair budgets therefore I am constantly on the look-out for products that can bring my hair to the next (Amal) level . This oil is a bit pricy, but what I like about it is that despite extensive use over the past month I still have around 100 ml left (90% that is). Even though I use it daily, and I use a lot, my hair doesn’t get oily and I don’t have to wash it more than usual. This oil promises to eliminate frizz and give you some extra shine. It has a kind of “va va voom” effect, making my hair more easy to manage, looking a bit like i just came out from a blow-dry, every hair in the place it should be. It also adds some shine and smells good and girlie. The negatives are the price and that it does not help dry ends, there you have to use a “stronger” oil. February 9, 2015 August 30, 2017 | Anna M.
I have said it before: I’m a fan on Rudolph Care. I love things that are organic, and I love products without harmful ingredients or chemicals. Read a little more on the Rudolph products here. The Acai Facial Scrub Mask from Rudolph is no exception. The mask claims to rejuvenate and hydrate, and I definitely feel that my skin is hydrated after using the mask. The mask is a creamy scrub mask, with a high degree of good oils, amongst them is shea butter, olive and coconut oil. Pulverised abricot kernels exfoliates the skin in a gentle way. This mask is especially good if your skin needs extra care, for example during winter time, when cold weather has dried out your skin, or during summertime, when the sun and bathing has left their marks. The product is in the expensive end, and there’s only 100 ml in the standard tube from Rudolph. However, you only need to apply a little every time, so that it lasts longer. Still, this is the reason for only three stars in “value for money”. 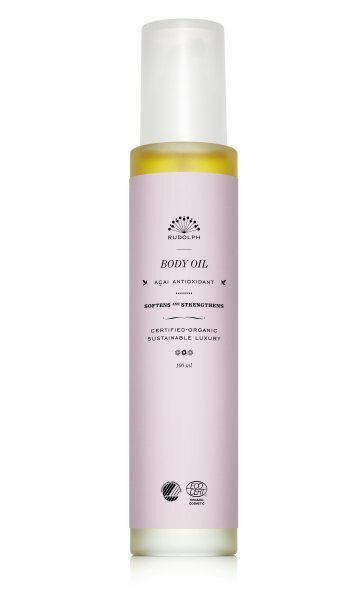 December 16, 2014 December 15, 2014 | Anna M.
This body oil is just simply yummy: It’s organic and has that natural “Rudolph smell”. Expensive. In a glass bottle. I have to admit this right away: I’m a fan on Rudolph Care. I love that the products are organic, without harmful ingredients and then I just love Andrea’s story (she’s the founder of Rudolph’s Care, by the way). Did I mention she’s Danish? (Like me, *cough cough*). Now, to the product: This Acai body oil has a lovely smell, it has a nice consistency, and even though it’s a body oil, it doesn’t lay on the surface of my skin and make everything greasy. It makes my skin very soft: I have a tendency to get small dry bumps on my skin, further my elbows can get dry in the winter: I used a HAY scrubbing glove in the shower and finished off with this Acai body oil, and now they’re gone. The only minus is that it’s very expensive and that there’s only 100 ml per bottle. Makes your skin soft like a baby. Made my skin a bit itchy straight after application. One of our goals as creators of this blog is to share products which our readers wouldn’t necessarily find by themselves, and which we consider a bargain. Baby oil is one of them – it works just as great as a pricy oil, it is usually allergy tested and odourless. This particular oil is very cheap, easy to apply and long-lasting. The minuses are that it takes some time to sink in and that straight after application I felt a bit itchy, which quickly disappeared. Tips: Put a few drops of your favourite perfume into the oil.